This booklet fits into a shirt pocket so it can be carried to the field. 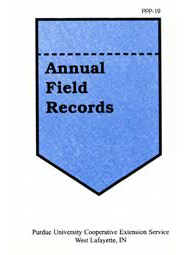 Record information in the booklet, and then transfer it into your crop record keeping system. This publication is part of the Crop Production Record Keeping System (PPP-18). Pages: Print: 72; PDF: 14.